Firstly, I'm pretty excited to be uploaded my first ever 'favourites' post here on my blog, I've often tried to write them, and either forgot to take pictures or just forgot to upload it at the right time, but I'm finally getting round to it so here's a lil' pat on the back to moi. Enough of that oops, let's get on with the favourites! 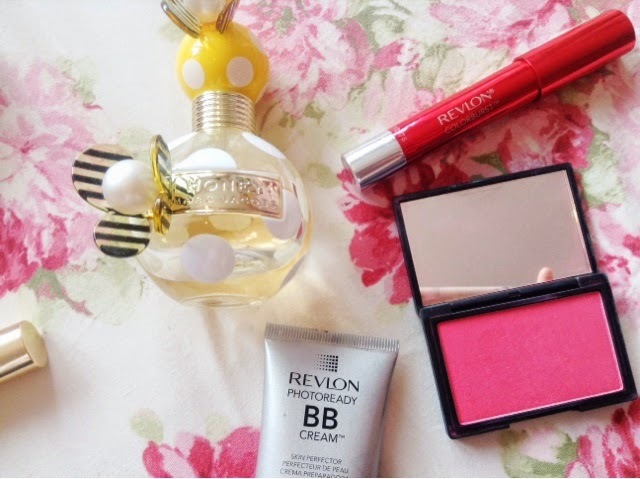 As I've been on holiday and it has been getting a bit warmer in the UK too, I haven't been as into wearing a heavy duty foundation as usual, but instead I've been using a BB cream, which was the Revlon Photoready BB Cream in 'light'. I love this because although it is a BB cream, which usually are just a glorified tinted moisturiser, it has lovely coverage and is a good balance between matte and dewy, which I love the look of. The shade is also perfect for my pale skin, so it's definitely a must for the upcoming spring summer months for me. Still on base makeup, I recently picked up the MAC Studio Fix powder in NW15, same as my foundation. It does have coverage to it so it can be used on it's own, but I like to dust a little over my makeup to set it and it works really well for that, keeping my skin matte but not looking cakey. Also, another new find is one of the famous Revlon Colourburst Laquer Balms in 'Provocateur', which I've only just got round to getting! I may be a tiny bit biased since I adore things like this, but this isn't a very talked about shade and I love it, it is quite pigmented and really glossy without being sticky. Not to mention the fab smell - who doesn't love a waft of mint when putting on your lipstick? 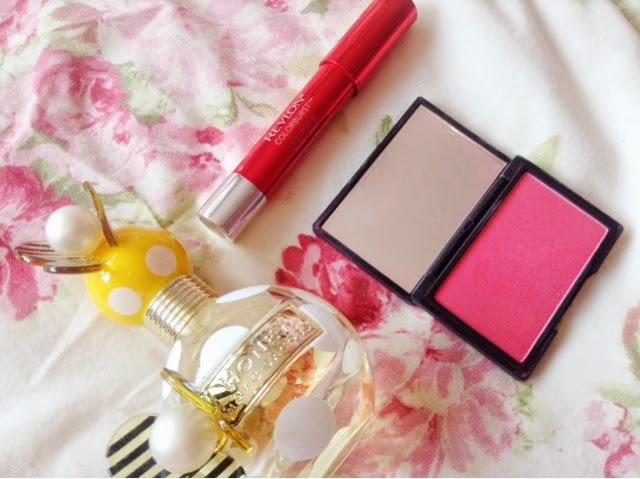 For complexion, I have rediscovered a gorgeous blush by Sleek, in Flamingo. It isn't a very well known shade like my very much loved Rose Gold, but used lightly on the tops of my cheeks, it's the perfect colour for summer and one I'll be using a lot more, as I haven't used it much in the colder months. Lastly for makeup, I've been using the ever so gorgeous YSL Babydoll mascara, which the packaging it's in itself could be a favourite, what isn't to love about the pink and gold? This has a plastic, thin brush which are my favourite, since they really grip onto the lashes to lengthen and volumise, and it seperates them really well! I think anyone would love to use this and have it visible on their dressing table. I've recently started using the lovely Mac Jacobs Honey perfume, which I think is more suited to this time of year with it's citrus and floral scent. The bottle is beautiful, the smell is lovely (the question of 'mmm, what perfume are you wearing?' always seems to come up when I wear it), what more can I say? 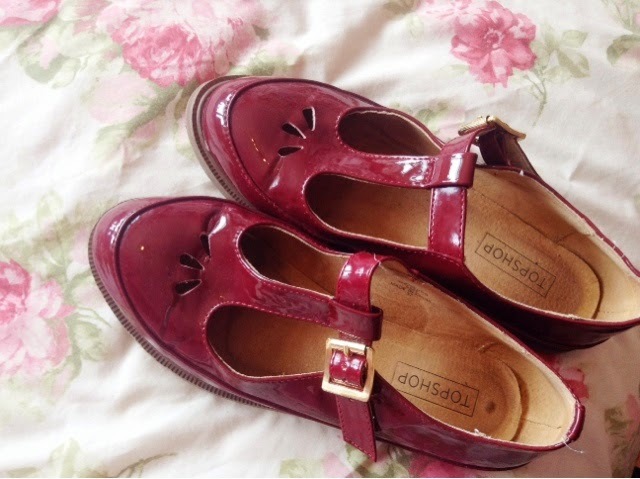 My final favourite are my gorgeous Topshop Mary Jane style shoes that I've had for a while now, but they have been so cute in winter with thick tights and skirts, but now it's summer I can wear them with little frill socks and dresses, and it looks so cute! So that is all for my first favourites post, better late than never right?